Aspiring scientists from The Sixth Form College, Solihull visited the University of Wolverhampton last week to take part in a Molecular Biology master class. 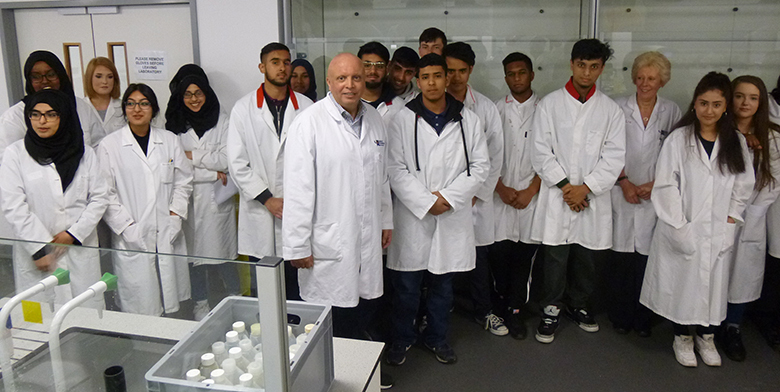 First year students on the BTEC Applied Sciences course went on the trip to the newly built 5-storey science centre, which boasts brand new Chemistry, Microbiology and Research laboratories. These facilities have flexible power and water supplies and touch screen tablets to make lectures interactive for students. The students carried out a genetic engineering practical, in which they had to transform Escherichia coli (E-Coli) and mix it with plasmid DNA. They had the opportunity to use the specialist equipment, such as the Gel Electrophoresis and Polymerase Chain Reaction kit. “This masterclass was a fantastic opportunity for our students because they get to see how science is taught at universities and how exciting and challenging these practicals are at degree level. Students can also use the data and results as evidence for one of the pass criteria in Unit 18: Genetics and Genetic Engineering. This practical followed hot on the heels of a Biochemistry masterclass at the University of Wolverhampton back in April and a Public Health masterclass at Birmingham City University just a couple of weeks ago.